These have been trying times for conservative bobblehead and pundit for hire Tomi Lahren. The former Blaze personality was reportedly fired by Glenn Beck for her pro-choice views—which she was careful to attribute to her limited-government ideology, and not the feminism that’s afforded her the option—leaving her to scrape by on the occasional televised tantrum or debate. We’d worry about her health, if we didn’t already know she’s still covered by her parents’ insurance—and if she weren’t the same person who thinks refugees are cowards and black activists are the new Ku Klux Klan. But because you can’t keep a good, “color-blind” agitator down, Lahren has found a new home at Fox News, Variety reports. The sentient “All Lives Matter” hashtag has signed on as a contributor whose primary responsibilities will be to out-obfuscate Sean Hannity, as well as appear in some as-yet-unannounced digital project for Fox News. 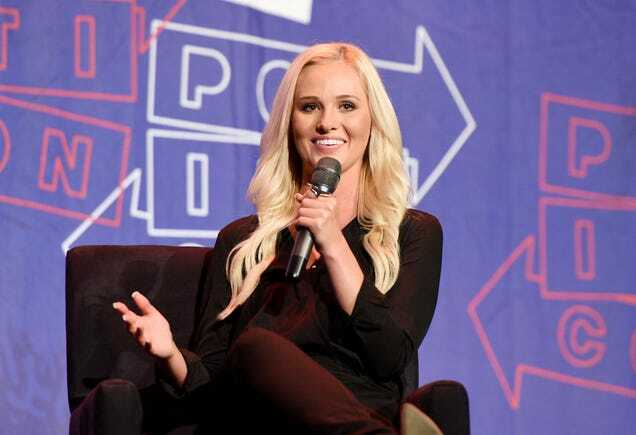 Lahren will make her debut on tonight’s Hannity, just in time to find a way to blame the natural disaster in Houston on progressives pushing for a female Doctor Who.